As many of you may know by now, the QuantaGrid D52G-4U server is now amongst the TOP500. QCT in collaboration with the National Center for High-performance Computing (NCHC) of the National Applied Research Laboratories (NARLabs) and other companies completed the construction of the Taiwania 2 with great applause. These all-in-one box servers combine simplified cloud management with leadership performance, scalability, availability, and efficiency. The Taiwania 2 features 9 PFLOPS (Rmax) on HPL benchmark, powered by 252x QuantaGrid D52G-4U servers each with 8x NVIDIA Tesla V100 32GB Tensor Core GPUs, adopting liquid cooling technology by Asetek to optimize energy efficiency, while providing rack-level integration with best practices in power and network cabling to speed up productivity which also places this system at #10 on the Green500 list. This is the first project of its kind at such a large scale for Taiwan’s HPC and AI market, providing more immediate and convenient computing services to various industries, and also for academia and research communities. The QuantaGrid D52G-4U is the latest purpose-built dual-socket Intel® Xeon Scalable accelerator server for AI and HPC computing, currently supporting three different baseboards optimized for different application. First, the D52G-4U supports eight NVIDIA Tesla V100 SXM2 GPU accelerators with maximum GPU-to-GPU 300 GB/s NVLink™ interconnect to deliver extreme training performance to shorten R&D development while adopting deep learning to innovate business models. 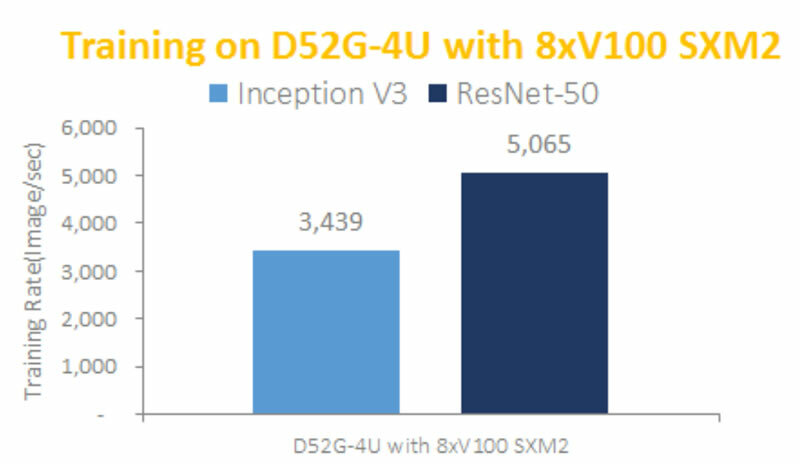 The D52G-4U has been proven to outperform on every popular convolutional neural network such as Inception V3 and the more complex Resnet-50 (see Image 1); Furthermore, it also demonstrates 96.2% efficiency while running GoogleNet on eight NVIDIA®Tesla V100’s (see image 2). With such high scale up efficiency, the D52G can squeeze the most computing power of multiple GPUs to accelerate training models. Second, the D52G-4U PCIe baseboard provides flexible topology on eight double-width GPU’s to optimize either CPU-to-GPU bandwidth or GPU-to-GPU communication to fine tune the performance for different HPC applications to reduce the risk of IT investment. Lastly, after training a model with high accuracy, the key factor to succeed in business innovation is looking at how the pre-trained model can be efficiently delivered to as many users as possible. The D52G-4U baseboard with twenty single-slots can satisfy massive inference demands concurrently with sixteen single slot power efficient GPUs like the NVIDIA Tesla® P4. This SKU also supports high bandwidth low latency Infiniband to scale out the performance and 24 small form factor storage bays with optional eight low latency NVMe SSDs to reduce IO reading and to feed large amounts of data to this powerful machine. At the Supercomputing Conference in Texas, it was announced that the Taiwania 2 was ranked 20, powered by QCT’s scale-up servers. The QuantaGrid D52G, one of our most powerful, reliable, and scalable QuantaGrid servers, is designed to support the industry’s most data-intensive applications while providing economic flexibility. The D52G brings unprecedented performance and scale to our 2-socket server with up to 300GB/s GPU to GPU communication. When you combine QCT’s leadership in cloud technology, experience, with system innovations to run large-scale, mission-critical applications, you get an ideal foundation for you to transform your IT infrastructure into a private or hybrid cloud. Visit www.qct.io to learn more or call us at 1-855-QCT-MUST.